Smoking cessation (colloquially quitting smoking) is the process of discontinuing tobacco smoking. Tobacco contains nicotine, which has been found to be one of the most addictive substances in the world. Nicotine makes the process of quitting often very prolonged and difficult. Smoking is the leading preventable cause of death worldwide, and quitting smoking significantly reduces the risk of dying from tobacco-related diseases such as heart disease and lung cancer. Seventy percent of smokers would like to quit smoking, and 50 percent report attempting to quit within the past year. Many different strategies can be used for smoking cessation, including quitting without assistance ("cold turkey" or cut down then quit), medications such as nicotine replacement therapy (NRT), cytisine or varenicline, and behavioral counseling. The majority of smokers who try to quit do so without assistance, though only 3 to 6% of quit attempts without assistance are successful. Use of medications and behavioral counseling both increase success rates, and a combination of both medication and behavioral interventions has been shown to be even more effective. Because nicotine is addictive, quitting smoking leads to symptoms of nicotine withdrawal such as craving, anxiety and irritability, depression, and weight gain. :2298 Professional smoking cessation support methods generally endeavor to address both nicotine addiction and nicotine withdrawal symptoms. Systematic reviews of the Cochrane Tobacco Addiction Group of the Cochrane Collaboration. As of 2012, this independent, international, not-for-profit organization has published over 60 systematic reviews "on interventions to prevent and treat tobacco addiction" which will be referred to as "Cochrane reviews." As it is common for ex-smokers to have made a number of attempts (often using different approaches on each occasion) to stop smoking before achieving long-term abstinence, identifying which approach or technique is eventually most successful is difficult; it has been estimated, for example, that "only about 4% to 7% of people are able to quit smoking on any given attempt without medicines or other help". However, in analysing a 1986 U.S. survey, Fiore et al. (1990) found that 95% of former smokers who had been abstinent for 1–10 years had made an unassisted last quit attempt. The most frequent unassisted methods were "cold turkey" and "gradually decreased number" of cigarettes. A 1995 meta-analysis estimated that the quit rate from unaided methods was 7.3% after an average of 10 months of follow-up. "Cold turkey" is a colloquial term indicating abrupt withdrawal from an addictive drug, and in this context indicates sudden and complete cessation of all nicotine use. In three studies, it was the quitting method cited by 76%, 85%, or 88% of long-term successful quitters. In a large British study of ex-smokers in the 1980s, before the advent of pharmacotherapy, 53% of the ex-smokers said that it was "not at all difficult" to stop, 27% said it was "fairly difficult", and the remaining 20% found it very difficult. A 21mg dose nicotine patch applied to the left arm. Nicotine replacement therapy (NRT): Five medications approved by the U.S. Food and Drug Administration (FDA) deliver nicotine in a form that does not involve the risks of smoking. NRTs are meant to be used for a short period of time and should be tapered down to a low dose before stopping. The five NRT medications, which in a Cochrane review increased the chances of stopping smoking by 50 to 70% compared to placebo or to no treatment, are: transdermal nicotine patches, gum, lozenges, sprays, and inhalers. A Cochrane review found further increased chance of success in a combination of the nicotine patch and a faster acting form. A study found that 93 percent of over-the-counter NRT users relapse and return to smoking within six months. Antidepressants: The antidepressant bupropion is considered a first-line medication for smoking cessation and has been shown in many studies to increase long-term success rates. People who take bupropion should be monitored for any unusual mood changes; bupropion also increases risk of seizures and should not be used in people with a seizure disorder. Nortriptyline has also been shown to increase smoking cessation success rates. Other antidepressants such as selective serotonin reuptake inhibitors (SSRIs) and St. John's wort have not been consistently shown to be effective for smoking cessation. Varenicline decreases the urge to smoke and reduces withdrawal symptoms and is therefore considered a first-line medication for smoking cessation. A systematic review found that varenicline had higher success rates than bupropion. A 2011 Cochrane review of 15 studies (13 of which had been sponsored by Pfizer) also found that varenicline was significantly superior to bupropion at one year but that varenicline and nicotine patches produced the same level of abstinence at 24 weeks. 2 mg/day of varenicline has been found to lead to the highest abstinence rate (33.2%) of any single therapy, while 1 mg/day leads to an abstinence rate of 25.4%. :109 A 2011 review of double-blind studies found that varenicline has increased risk of serious adverse cardiovascular events compared with placebo. Varenicline may cause neuropsychiatric side effects; for example, in 2008 the UK, Medicines and Healthcare products Regulatory Agency issued a warning about possible suicidal thoughts and suicidal behavior associated with varenicline. Gradual reduction involves slowly reducing one's daily intake of nicotine. This can theoretically be accomplished through repeated changes to cigarettes with lower levels of nicotine, by gradually reducing the number of cigarettes smoked each day, or by smoking only a fraction of a cigarette on each occasion. A 2009 systematic review by researchers at the University of Birmingham found that gradual nicotine replacement therapy could be effective in smoking cessation. There is no significant difference in quit rates between smokers who quit by gradual reduction or abrupt cessation as measured by abstinence from smoking of at least six months from the quit day, suggesting that people who want to quit can choose between these two methods. Most smoking cessation resources such as the CDC and Mayo Clinic encourage smokers to create a quit plan, including setting a quit date, which helps them anticipate and plan ahead for smoking challenges. A quit plan can improve a smoker’s chance of a successful quit as can as setting Monday as the quit date, given that research has shown that Monday more than any other day is when smokers are seeking information online to quit smoking and calling state quit lines. Policies making workplaces and public places smoke-free. It is estimated that "comprehensive clean indoor laws" can increase smoking cessation rates by 12%–38%. In 2008, the New York State of Alcoholism and Substantance Abuse Services banned smoking by patients, staff and volunteers at 1,300 addiction treatment centers. Voluntary rules making homes smoke-free, which are thought to promote smoking cessation. Initiatives to educate the public regarding the health effects of second-hand smoke. Increasing the price of tobacco products, for example by taxation. The US Task Force on Community Preventive Services found "strong scientific evidence" that this is effective in increasing tobacco use cessation. :28–30 It is estimated that an increase in price of 10% will increase smoking cessation rates by 3–5%. Mass media campaigns. The US Task Force on Community Preventive Services declared that "strong scientific evidence" existed for these when "combined with other interventions",:30–32 but a Cochrane review concluded that it was "difficult to establish their independent role and value". Great American Smokeout is an annual event that invites smokers to quit for one day, hoping they will be able to extend this forever. The World Health Organization's World No Tobacco Day is held on May 31 each year. Online social cessation networks attempt to emulate offline group cessation models using purpose built web applications. They are designed to promote online social support and encouragement for smokers when (usually automatically calculated) milestones are reached. Early studies have shown social cessation to be especially effective with smokers aged 19–29. Group or individual psychological support can help people who want to quit. This form of counselling can be effective alone; combining it with medication is more effective, and the number of sessions of support with medication correlates with effectiveness. :89–90,101–103 The counselling styles that have been effective in smoking cessation activities include motivational interviewing, cognitive behavioural therapy and Acceptance and Commitment Therapy. The Transtheoretical Model including "stages of change" has been used in tailoring smoking cessation methods to individuals. However, a 2010 Cochrane review concluded that "stage-based self-help interventions (expert systems and/or tailored materials) and individual counselling were neither more nor less effective than their non-stage-based equivalents." In-person self-help groups such as Nicotine Anonymous or electronic self-help groups such as Stomp It Out. Newsgroups: The Usenet group alt.support.stop-smoking has been used by people quitting smoking as a place to go to for support from others. Interactive web-based and stand-alone computer programs and online communities which assist participants in quitting. For example, "quit meters" keep track of statistics such as how long a person has remained abstinent. In the 2008 US Guideline, there was no meta-analysis of computerised interventions, but they were described as "highly promising. ":93–94 A meta-analysis published in 2009, a Cochrane review published in 2010, and a 2011 systematic review found the evidence base for such interventions weak. Mobile phone-based interventions: A 2016 Cochrane review stated that cumulative scientific evidence indicates "a beneficial impact of mobile phone-based smoking cessation interventions on six-month cessation outcomes....in high-income countries with good tobacco control policies". Self-help books such as Allen Carr's Easy Way to Stop Smoking. Spirituality: In one survey of adult smokers, 88% reported a history of spiritual practice or belief, and of those more than three-quarters were of the opinion that using spiritual resources may help them quit smoking. Various methods exist which allow a smoker to see the impact of their tobacco use, and the immediate effects of quitting. Using biochemical feedback methods can allow tobacco-users to be identified and assessed, and the use of monitoring throughout an effort to quit can increase motivation to quit. Breath carbon monoxide (CO) monitoring: Because carbon monoxide is a significant component of cigarette smoke, a breath carbon monoxide monitor can be used to detect recent cigarette use. Carbon monoxide concentration in breath has been shown to be directly correlated with the CO concentration in blood, known as percent carboxyhemoglobin. The value of demonstrating blood CO concentration to a smoker through a non-invasive breath sample is that it links the smoking habit with the physiological harm associated with smoking. Within hours of quitting, CO concentrations show a noticeable decrease, and this can be encouraging for someone working to quit. Breath CO monitoring has been utilized in smoking cessation as a tool to provide patients with biomarker feedback, similar to the way in which other diagnostic tools such as the stethoscope, the blood pressure cuff, and the cholesterol test have been used by treatment professionals in medicine. Cotinine: A metabolite of nicotine, cotinine is present in smokers. Like carbon monoxide, a cotinine test can serve as a reliable biomarker to determine smoking status. Cotinine levels can be tested through urine, saliva, blood, or hair samples, with one of the main concerns of cotinine testing being the invasiveness of typical sampling methods. While both measures offer high sensitivity and specificity, they differ in usage method and cost. As an example, breath CO monitoring is non-invasive, while cotinine testing relies on a bodily fluid. These two methods can be used either alone or together, for example, in a situation where abstinence verification needs additional confirmation. One 2008 Cochrane review concluded that "incentives and competitions have not been shown to enhance long-term cessation rates." A different 2008 Cochrane review found that one type of competition, "Quit and Win," did increase quit rates among participants. Interventions delivered via healthcare providers and healthcare systems have been shown to improve smoking cessation among people who visit those services. A 2008 Guideline meta-analysis estimated that physician advice to quit smoking led to a quit rate of 10.2%, as opposed to a quit rate of 7.9% among patients who did not receive physician advice to quit smoking. :82–83 A Cochrane review found that even brief advice from physicians had "a small effect on cessation rates." However, one study from Ireland involving vignettes found that physicians' probability of giving smoking cessation advice declines with the patient's age, and another study from the U.S. found that only 81% of smokers age 50 or greater received advice on quitting from their physicians in the preceding year. Both physicians and non-physicians increased abstinence rates compared with self-help or no clinicians. :87–88 For example, a Cochrane review of 31 studies found that nursing interventions increased the likelihood of quitting by 28%. Dental professionals also provide a key component in increasing tobacco abstinence rates in the community through counseling patients on the effects of tobacco on oral health in conjunction with an oral exam. According to the 2008 Guideline, based on two studies the training of clinicians in smoking cessation methods may increase abstinence rates;:130 however, a Cochrane review found and measured that such training decreased smoking in patients. Nicotine replacement therapy is the general term for using products that contain nicotine but not tobacco to aid cessation of smoking. These include nicotine lozenges that are sucked, nicotine gum and inhalers, nicotine patches, as well as electronic cigarettes. "E-cigarettes, with or without nicotine-based ejuices, were modestly effective at helping smokers to quit, with similar achievement of abstinence as with nicotine patches, and few adverse events. Uncertainty exists about the place of e-cigarettes in tobacco control, and more research is urgently needed to clearly establish their overall benefits and harms at both individual and population levels". Additionally, a 2013 review studied the effects of smoke cessation through a randomized controlled study using electronic cigarettes. The subjects of this study were conventional cigarette smokers with no intention of quitting. Their findings indicated that there was no significant impact on smoke cessation. Likewise, the effects of complete abstinence from smoking were not prolonged either. Chewing cinnamon sticks or gum has been recommended when trying to quit the use of tobacco. Aromatherapy: A 2006 book reviewing the scientific literature on aromatherapy identified only one study on smoking cessation and aromatherapy; the study found that "inhalation of vapor from black pepper extract reduces smoking withdrawal symptoms". Hypnosis: Hypnosis often involves the hypnotherapist suggesting to the patient the unpleasant outcomes of smoking. Clinical trials studying hypnosis and hypnotherapy as a method for smoking cessation have been inconclusive;:100 however, a randomized trial published in 2008 found that hypnosis and nicotine patches "compares favorably" with standard behavioral counseling and nicotine patches in 12-month quit rates. Herbs: Many herbs have been studied as a method for smoking cessation, including lobelia and St John's wort. The results are inconclusive, but St. Johns Wort shows few adverse events. Lobelia has been used to treat respiratory diseases like asthma and bronchitis, and has been used for smoking cessation because of chemical similarities to tobacco; lobelia is now listed in the FDA's Poisonous Plant Database. Lobelia can still be found in many products sold for smoking cessation and should be used with caution. Psilocybin: One pilot study of 15 participants who had previously found it difficult to quit smoking found that 12 of them were able to quit smoking for at least 6 months after a cessation program that included closely administered use of pharmaceutical-grade psilocybin pills. Smokeless tobacco: There is little smoking in Sweden, which is reflected in the very low cancer rates for Swedish men. Use of snus (a form of steam-pasteurised, rather than heat-pasteurised, air-cured smokeless tobacco) is an observed cessation method for Swedish men and even recommended by some Swedish doctors. A Cochrane review, mainly of studies combining motivational enhancement and psychological support, concluded that "complex approaches" for smoking cessation among young people show promise. The 2008 US Guideline recommends counselling-style support for adolescent smokers on the basis of a meta-analysis of seven studies. :159–161 Neither the Cochrane review nor the 2008 Guideline recommends medications for adolescents who smoke. Smoking during pregnancy can cause adverse health effects in both the woman and the fetus. The 2008 US Guideline determined that "person-to-person psychosocial interventions" (typically including "intensive counseling") increased abstinence rates in pregnant women who smoke to 13.3%, compared with 7.6% in usual care. :165–167 Mothers who smoke during pregnancy have a greater tendency towards premature births. Their babies are often underdeveloped, have smaller organs, and weigh much less compared with the normal baby. In addition, these babies have worse immune systems, making them more susceptible to many diseases in early childhood, such as middle ear inflammations and asthmatic bronchitis which can bring about a lot of agony and suffering. As well, there is a high chance that they will become smokers themselves when grown up. It is a widely spread myth that a female smoker can cause harm to her fetus by quitting immediately upon discovering that she is with child. Though this idea does seem to follow logic, it is not based on any medical study or fact. A 2008 Cochrane review of smoking cessation activities in work-places concluded that "interventions directed towards individual smokers increase the likelihood of quitting smoking." A 2010 systematic review determined that worksite incentives and competitions needed to be combined with additional interventions to produce significant increases in smoking cessation rates. Smokers who are hospitalised may be particularly motivated to quit. :149–150 A 2007 Cochrane review found that interventions beginning during a hospital stay and continuing for one month or more after discharge were effective in producing abstinence. People who have mood disorders or attention deficit hyperactivity disorders have a greater chance to begin smoking and lower chance to quit smoking. Comparison of success rates across interventions can be difficult because of different definitions of "success" across studies. Robert West and Saul Shiffman, authorities in this field recognized by government health departments in a number of countries,:73,76,80 have concluded that, used together, "behavioral support" and "medication" can quadruple the chances that a quit attempt will be successful. A 2008 systematic review in the European Journal of Cancer Prevention found that group behavioural therapy was the most effective intervention strategy for smoking cessation, followed by bupropion, intensive physician advice, nicotine replacement therapy, individual counselling, telephone counselling, nursing interventions, and tailored self-help interventions; the study did not discuss varenicline. Individuals who sustained damage to the insula were able to more easily abstain from smoking. Quitting can be harder for individuals with dark pigmented skin compared to individuals with pale skin since nicotine has an affinity for melanin-containing tissues. Studies suggest this can cause the phenomenon of increased nicotine dependence and lower smoking cessation rate in darker pigmented individuals. There is an important social component to smoking. A 2008 study of a densely interconnected network of over 12,000 individuals found that smoking cessation by any given individual reduced the chances of others around them lighting up by the following amounts: a spouse by 67%, a sibling by 25%, a friend by 36%, and a coworker by 34%. Nevertheless, a Cochrane review determined that interventions to increase social support for a smoker's cessation attempt did not increase long-term quit rates. Smokers who are trying to quit are faced with social influences that may persuade them to conform and continue smoking. Cravings are easier to detain when one's environment does not provoke the habit. If a person who stopped smoking has close relationships with active smokers they are often put into situations that make the urge to conform more tempting. However, in a small group with at least one other not smoking, the likelihood of conformity decreases. The social influence to smoke cigarettes has been proven to rely on simple variables. One researched variable depends on whether the influence is from a friend or non-friend. the research shows that individuals are 77% more likely to conform to non-friends, while close friendships decrease conformity. Therefore, if an acquaintance offers a cigarette as a polite gesture, the person who has stopped smoking will be more likely to break his commitment than if a friend had offered. Expectations and attitude are significant factors. A self-perpetuating cycle occurs when a person feels bad for smoking yet smokes to alleviate feeling bad. Breaking that cycle can be a key in changing the sabotaging attitude. Relapse (resuming smoking after quitting) has been related to psychological issues such as low self-efficacy or non-optimal coping responses; however, psychological approaches to prevent relapse have not been proven to be successful. In contrast, varenicline may help some relapsed smokers. In a 2007 review of the effects of abstinence from tobacco, Hughes concluded that "anger, anxiety, depression, difficulty concentrating, impatience, insomnia, and restlessness are valid withdrawal symptoms that peak within the first week and last 2–4 weeks." In contrast, "constipation, cough, dizziness, increased dreaming, and mouth ulcers" may or may not be symptoms of withdrawal, while drowsiness, fatigue, and certain physical symptoms ("dry mouth, flu symptoms, headaches, heart racing, skin rash, sweating, tremor") were not symptoms of withdrawal. Giving up smoking is associated with an average weight gain of 4–5 kilograms (8.8–11.0 lb) after 12 months, most of which occurs within the first three months of quitting. Smoking over-expresses the gene AZGP1 which stimulates lipolysis, so smoking cessation may decrease lipolysis. Smoking suppresses appetite, which may be caused by nicotine's effect on central autonomic neurons (e.g., via regulation of melanin concentrating hormone neurons in the hypothalamus). Heavy smokers are reported to burn 200 calories per day more than non-smokers eating the same diet. Possible reasons for this phenomenon include nicotine's ability to increase energy metabolism or nicotine's effect on peripheral neurons. The 2008 Guideline suggests that sustained-release bupropion, nicotine gum, and nicotine lozenge be used "to delay weight gain after quitting. ":173–176 However, a 2012 Cochrane review concluded that "The data are not sufficient to make strong clinical recommendations for effective programmes" for preventing weight gain. Like other physically addictive drugs, nicotine addiction causes a down-regulation of the production of dopamine and other stimulatory neurotransmitters as the brain attempts to compensate for the artificial stimulation caused by smoking. Therefore, when people stop smoking, depressive symptoms such as suicidal tendencies or actual depression may result. This side effect of smoking cessation may be particularly common in women, as depression is more common among women than among men. A recent study by The British Journal of Psychiatry has found that smokers who successfully quit feel less anxious afterward with the effect being greater among those who had mood and anxiety disorders than those that smoked for pleasure. The British Doctors Study showed that those who stopped smoking before they reached 30 years of age lived almost as long as those who never smoked. Stopping in one's sixties can still add three years of healthy life. A randomized trial from the U.S. and Canada showed that a smoking cessation program lasting 10 weeks decreased mortality from all causes over 14 years later. Another published study, "Smoking Cessation Reduces Postoperative Complications: A Systematic Review and Meta-analysis," examined six randomized trials and 15 observational studies to look at the effects of preoperative smoking cessation on postoperative complications. The findings were: 1) taken together, the studies demonstrated decreased the likelihood of postoperative complications in patients who ceased smoking prior to surgery; 2) overall, each week of cessation prior to surgery increased the magnitude of the effect by 19%. A significant positive effect was noted in trials where smoking cessation occurred at least four weeks prior to surgery; 3) For the six randomized trials, they demonstrated on average a relative risk reduction of 41% for postoperative complications. Smokers as a percentage of the population for the United States, the Netherlands, Norway, Japan, and Finland. In a 1997 U.S. analysis, the estimated cost per QALY varied by the type of cessation approach, ranging from group intensive counselling without nicotine replacement at $1108 per QALY to minimal counselling with nicotine gum at $4542 per QALY. A study from Erasmus University Rotterdam limited to people with chronic obstructive pulmonary disease found that the cost-effectiveness of minimal counselling, intensive counselling, and drug therapy were €16,900, €8,200, and €2,400 per QALY gained respectively. Among National Health Service smoking cessation clients in Glasgow, pharmacy one-to-one counselling cost £2,600 per QALY gained and group support cost £4,800 per QALY gained. The frequency of smoking cessation among smokers varies across countries. Smoking cessation increased in Spain between 1965 and 2000, in Scotland between 1998 and 2007, and in Italy after 2000. In contrast, in the U.S. the cessation rate was "stable (or varied little)" between 1998 and 2008, and in China smoking cessation rates declined between 1998 and 2003. Nevertheless, in a growing number of countries there are now more ex-smokers than smokers. For example, in the U.S. as of 2010, there were 47 million ex-smokers and 46 million smokers. ↑ "Guide to quitting smoking". American Cancer Society. 2011-01-31. Retrieved 2011-02-15. ↑ World Health Organization. WHO Report on the Global Health Epidemic, 2011: Warning about the dangers of tobacco. http://whqlibdoc.who.int/publications/2011/9789240687813_eng.pdf. ↑ "Quitting smoking among adults--United States, 2001-2010". MMWR. Morbidity and mortality weekly report. 60 (44): 1513–1519. Nov 11, 2011. ISSN 1545-861X. PMID 22071589. Retrieved 2015-05-09. ↑ Rigotti, Nancy A. (Oct 17, 2012). "Strategies to help a smoker who is struggling to quit". JAMA. 308 (15): 1573–1580. doi:10.1001/jama.2012.13043. ISSN 1538-3598. PMID 23073954. Retrieved 2015-05-09. ↑ Stead, Lindsay F.; Lancaster, Tim (2012). "Combined pharmacotherapy and behavioural interventions for smoking cessation". The Cochrane Database of Systematic Reviews. 10: CD008286. doi:10.1002/14651858.CD008286.pub2. ISSN 1469-493X. PMID 23076944. Retrieved 2015-05-09. ↑ Benowitz NL; Benowitz, Neal L. (2010). "Nicotine addiction". N Engl J Med. 362 (24): 2295–303. doi:10.1056/NEJMra0809890. PMC 2928221 . PMID 20554984. 1 2 Cochrane Tobacco Addiction Group (2010-03-02). "Welcome". Retrieved 2011-02-17. 1 2 3 4 5 6 7 8 9 10 11 12 13 14 15 16 17 18 19 20 21 22 23 24 25 26 27 Fiore MC, Jaén CR, Baker TB, et al. (2008). Clinical practice guideline: treating tobacco use and dependence: 2008 update (PDF). Rockville, MD: U.S. Department of Health and Human Services, Public Health Service. Retrieved 2011-02-16. ↑ Fiore MC, Bailey WC, Cohen SJ, et al. (1996). Smoking cessation. Clinical practice guideline no. 18. AHCPR publication no. 96-0692. Rockville, MD: U.S. Department of Health and Human Services, Public Health Service, Agency for Health Care Policy and Research. ↑ Fiore MC, Bailey WC, Cohen SJ, et al. (2000). Clinical practice guideline: treating tobacco use and dependence (PDF). Rockville, MD: U.S. Department of Health and Human Services, Public Health Service. Retrieved 2011-02-16. ↑ "Conflict over officials' stop-smoking advice". msnbc.com. Associated Press. 2008-05-07. Retrieved 2011-02-19. ↑ Ferguson J, Bauld L, Chesterman J, Judge K (2005). "The English smoking treatment services: one-year outcomes" (PDF). Addiction. 100 (Suppl 2): 59–69. doi:10.1111/j.1360-0443.2005.01028.x. PMID 15755262. 1 2 3 "Guide to quitting smoking. A word about quitting success rates". American Cancer Society. 2011-01-31. Retrieved 2011-02-17. 1 2 3 Fiore MC, Novotny TE, Pierce JP, Giovino GA, Hatziandreu EJ, Newcomb PA, Surawicz TS, Davis RM (1990). "Methods used to quit smoking in the United States. Do cessation programs help?". JAMA. 263 (20): 2760–5. doi:10.1001/jama.263.20.2760. PMID 2271019. ↑ Baillie AJ, Mattick RP, Hall W (1995). "Quitting smoking: estimation by meta-analysis of the rate of unaided smoking cessation". Aust J Public Health. 19 (2): 129–31. doi:10.1111/j.1753-6405.1995.tb00361.x. PMID 7786936. 1 2 3 Lee CW, Kahende J (2007). "Factors associated with successful smoking cessation in the United States, 2000". Am J Public Health. 97 (8): 1503–9. doi:10.2105/AJPH.2005.083527. PMC 1931453 . PMID 17600268. ↑ Doran CM, Valenti L, Robinson M, Britt H, Mattick RP (2006). "Smoking status of Australian general practice patients and their attempts to quit". Addict Behav. 31 (5): 758–66. doi:10.1016/j.addbeh.2005.05.054. PMID 16137834. 1 2 Chapman S, MacKenzie R (2010-02-09). "The global research neglect of unassisted smoking cessation: causes and consequences". PLoS Medicine. Public Library of Science. 7 (2): e1000216. doi:10.1371/journal.pmed.1000216. PMC 2817714 . PMID 20161722. ↑ Millstone K (2007-02-13). "Nixing the patch: Smokers quit cold turkey". Columbia.edu News Service. Retrieved 2011-02-21. 1 2 John R Hughes; et al. (2014). "Antidepressants for smoking cessation.". Cochrane Database of Systematic Reviews. 1: CD000031. doi:10.1002/14651858.CD000031.pub4. PMID 24402784. ↑ Pfizer Canada Inc (2010-05-28). "Product monograph. PrChampix (varenicline tartrate tablets)". Retrieved 2011-02-22. ↑ Singh S, Loke Y, Spangler J, Furberg C (July 4, 2011). "Risk of serious adverse cardiovascular events associated with varenicline: a systematic review and meta-analysis". Canadian Medical Association Journal. 183 (12): 1359–66. doi:10.1503/cmaj.110218. PMC 3168618 . PMID 21727225. ↑ Medicines and Healthcare products Regulatory Agency (July 2008). "Drug safety advice. Varenicline: suicidal thoughts and behaviour" (PDF). Drug Safety Update. 1 (12): 2–3. Retrieved 2011-02-21. ↑ Phend C (2009-04-03). "Gradual cutback with nicotine replacement boosts quit rates". MedPage Today. Retrieved 2011-02-20. ↑ Moore D, Aveyard P, Connock M, Wang D, Fry-Smith A, Barton P (2009). "Effectiveness and safety of nicotine replacement therapy assisted reduction to stop smoking: systematic review and meta-analysis". BMJ. 338: b1024. doi:10.1136/bmj.b1024. PMC 2664870 . PMID 19342408. ↑ "Making a Quit Plan". Centers for Disease Control and Prevention. Retrieved 19 October 2015. ↑ "Preparing for Quit Day". Mayo Clinic. Mayo Clinic. Retrieved 19 October 2015. ↑ Smit, Eline; Hoving, Ciska; Schelleman-Offermans, Karen; West, Robert; de Vries, Hein (September 2014). "Predictors of successful and unsuccessful quit attempts among smokers motivated to quit". Addictive Behaviors. 39 (9): 1318–1324. doi:10.1016/j.addbeh.2014.04.017. ↑ de Vries, Hein; Eggers, Sander; Bolman, Catherine (April 2013). "The role of action planning and plan enactment for smoking cessation". BMC Public Health. 13: 393. doi:10.1186/1471-2458-13-393. ↑ Bolmana, Catherine; Matthijs Eggersb, Sander; van Oschb, Liesbeth; Te Poelc, Fam; Candeld, Math; de Vries, Hein (Oct 2015). "Is Action Planning Helpful for Smoking Cessation? Assessing the Effects of Action Planning in a Web-Based Computer-Tailored Intervention". Substance Use & Misuse. 50 (10): 1249–1260. doi:10.3109/10826084.2014.977397. ↑ Ayers, John; Althouse, Benjamin; Johnson, Morgan; Cohen, Joanna (January 2014). "Circaseptan (weekly) rhythms in smoking cessation considerations.". JAMA Internal Medicine. 1 (174): 146–148. doi:10.1001/jamainternmed.2013.11933. ↑ Erbas, Bircan; Bui, Quang; Huggins, Richard; Harper, Todd; White, Victoria (Feb 2006). "Investigating the relation between placement of Quit antismoking advertisements and number of telephone calls to Quitline: a semiparametric modelling approach". Journal of Epidemiology and Community Health. 60 (1): 180–182. doi:10.1136/jech.2005.038109. 1 2 3 Lemmens V, Oenema A, Knut IK, Brug J (2008). "Effectiveness of smoking cessation interventions among adults: a systematic review of reviews" (PDF). Eur J Cancer Prev. 17 (6): 535–44. doi:10.1097/CEJ.0b013e3282f75e48. PMID 18941375. ↑ "State-Mandated Tobacco Ban, Integration of Cessation Services, and Other Policies Reduce Smoking Among Patients and Staff at Substance Abuse Treatment Centers". Agency for Healthcare Research and Quality. 2013-02-27. Retrieved 2013-05-13. ↑ Centers for Disease Control and Prevention (CDC) (May 2007). "State-specific prevalence of smoke-free home rules--United States, 1992-2003". MMWR Morb. Mortal. Wkly. Rep. 56 (20): 501–4. PMID 17522588. ↑ "Quitza - The Ex Smokers Social Network". Quitza. Retrieved 2016-07-01. ↑ Baskerville, Neill Bruce; Azagba, Sunday; Norman, Cameron; McKeown, Kyle; Brown, K. Stephen (2015-06-04). "Effect of a Digital Social Media Campaign on Young Adult Smoking Cessation". Nicotine & Tobacco Research: ntv119. doi:10.1093/ntr/ntv119. ISSN 1462-2203. PMID 26045252. ↑ Stead LF, Lancaster T (2005). Stead, Lindsay F, ed. "Group behaviour therapy programmes for smoking cessation". Cochrane Database Syst Rev (2): CD001007. doi:10.1002/14651858.CD001007.pub2. PMID 15846610. ↑ Lancaster T, Stead LF (2005). Lancaster, Tim, ed. "Individual behavioural counselling for smoking cessation". Cochrane Database Syst Rev (2): CD001292. doi:10.1002/14651858.CD001292.pub2. PMID 15846616. ↑ Hettema JE, Hendricks PS (2010). "Motivational interviewing for smoking cessation: a meta-analytic review". J Consult Clin Psychol. 78 (6): 868–84. doi:10.1037/a0021498. PMID 21114344. ↑ Heckman CJ, Egleston BL, Hofmann MT (2010). "Efficacy of motivational interviewing for smoking cessation: a systematic review and meta-analysis". Tob Control. 19 (5): 410–6. doi:10.1136/tc.2009.033175. PMC 2947553 . PMID 20675688. ↑ Perkins KA, Conklin CA, Levine MD (2008). Cognitive-behavioral therapy for smoking cessation: a practical guidebook to the most effective treatment. New York: Routledge. ISBN 978-0-415-95463-1. 1 2 Ruiz, F. J. (2010). "A review of Acceptance and Commitment Therapy (ACT) empirical evidence: Correlational, experimental psychopathology, component and outcome studies". International Journal of Psychology and Psychological Therapy. 10 (1): 125–62. ↑ Prochaska JO, Velicer WF, DiClemente CC, Fava J (1988). "Measuring processes of change: applications to the cessation of smoking". J Consult Clin Psychol. 56 (4): 520–8. doi:10.1037/0022-006X.56.4.520. PMID 3198809. ↑ DiClemente CC, Prochaska JO, Fairhurst SK, Velicer WF, Velasquez MM, Rossi JS (1991). "The process of smoking cessation: an analysis of precontemplation, contemplation, and preparation stages of change" (PDF). J Consult Clin Psychol. 59 (2): 295–304. doi:10.1037/0022-006X.59.2.295. PMID 2030191. Retrieved 2011-02-15. ↑ Velicer WF, Prochaska JO, Rossi JS, Snow MG (1992). "Assessing outcome in smoking cessation studies". Psychol Bull. 111 (1): 23–41. doi:10.1037/0033-2909.111.1.23. PMID 1539088. ↑ Prochaska JO, DiClemente CC, Velicer WF, Rossi JS (1993). "Standardized, individualized, interactive, and personalized self-help programs for smoking cessation" (PDF). Health Psychol. 12 (5): 399–405. doi:10.1037/0278-6133.12.5.399. PMID 8223364. Retrieved 2011-02-15. ↑ Lancaster T, Stead LF (2005). Lancaster, Tim, ed. "Self-help interventions for smoking cessation". Cochrane Database Syst Rev (3): CD001118. doi:10.1002/14651858.CD001118.pub2. PMID 16034855. ↑ "Nicotine Anonymous (official website)". Dallas, TX: Nicotine Anonymous World Services. Retrieved 2011-02-21. ↑ Glasser I (2010). "Nicotine Anonymous may benefit nicotine-dependent individuals". Am J Public Health. 100 (2): 196; author reply 196–7. doi:10.2105/AJPH.2009.181545. PMC 2804638 . PMID 20019295. ↑ "Stomp It Out". San Francisco, CA: Experience Project. Retrieved 2011-02-21. ↑ Uhler D (1995-11-15). "Breaking the habit - these tips can keep your good intentions from going up in smoke". San Antonio Express-News. ↑ Hendrick B (2009-05-26). "Computer is an ally in quit-smoking fight. Study shows web- and computer-based programs help smokers quit". WebMD Health News. Retrieved 2011-02-21. ↑ Myung SK, McDonnell DD, Kazinets G, Seo HG, Moskowitz JM (2009). "Effects of Web- and computer-based smoking cessation programs: meta-analysis of randomized controlled trials". Arch Intern Med. 169 (10): 929–37. doi:10.1001/archinternmed.2009.109. PMID 19468084. ↑ Hutton HE, Wilson LM, Apelberg BJ, Avila Tang E, Odelola O, Bass EB, Chander G (Feb 2011). "A systematic review of randomized controlled trials: web-based interventions for smoking cessation among adolescents, college students, and adults". Nicotine Tob Res. 13 (4): 227–38. doi:10.1093/ntr/ntq252. PMID 21350042. ↑ Brendryen H.; Kraft P. (2008). "Happy ending: a randomized controlled trial of a digital multi-media smoking cessation intervention". Addiction. 103 (3): 478–84. doi:10.1111/j.1360-0443.2007.02119.x. PMID 18269367. ↑ Brendryen H.; Drozd F.; Kraft P. (2008). "A digital smoking cessation program delivered through internet and cell phone without nicotine replacement (happy ending): randomized controlled trial". J Med Internet Res. 10 (5): 555. doi:10.2196/jmir.1005. PMID 19087949. ↑ Gonzales D, Redtomahawk D, Pizacani B, Bjornson WG, Spradley J, Allen E, Lees P (2007). "Support for spirituality in smoking cessation: results of pilot survey". Nicotine Tob Res. 9 (2): 299–303. doi:10.1080/14622200601078582. PMID 17365761. ↑ Tang, Yi-Yuan; Tang, Rongxiang; Posner, Michael I. "Mindfulness meditation improves emotion regulation and reduces drug abuse". Drug and Alcohol Dependence. 163: S13–S18. doi:10.1016/j.drugalcdep.2015.11.041. 1 2 Bittoun R. (2008). Carbon monoxide meter: The essential clinical tool- the ‘stethoscope"-of smoking cessation. Journal of Smoking Cessation, 3(2); 69-70. ↑ Florescu A, Ferrence R, Einarson T, Selby P, Soldin O, Koren G (2009). "Methods for quantification of exposure to cigarette smoking and environmental tobacco smoke: focus on developmental toxicology". Therapeutic Drug Monitoring. 31 (1): 14–30. doi:10.1097/FTD.0b013e3181957a3b. PMC 3644554 . PMID 19125149. ↑ Cahill K, Perera R (2008). Cahill, Kate, ed. "Competitions and incentives for smoking cessation". Cochrane Database Syst Rev (3): CD004307. doi:10.1002/14651858.CD004307.pub3. PMID 18646105. ↑ Cahill K, Perera R (2008). Cahill, Kate, ed. "Quit and Win contests for smoking cessation". Cochrane Database Syst Rev (4): CD004986. doi:10.1002/14651858.CD004986.pub3. PMID 18843674. ↑ Maguire CP, Ryan J, Kelly A, O'Neill D, Coakley D, Walsh JB (2000). "Do patient age and medical condition influence medical advice to stop smoking?". Age Ageing. 29 (3): 264–6. doi:10.1093/ageing/29.3.264. PMID 10855911. ↑ Ossip-Klein DJ, McIntosh S, Utman C, Burton K, Spada J, Guido J (2000). "Smokers ages 50+: who gets physician advice to quit?" (PDF). Prev Med. 31 (4): 364–9. doi:10.1006/pmed.2000.0721. PMID 11006061. ↑ Rice VH, Stead LF (2008). Rice, Virginia Hill, ed. "Nursing interventions for smoking cessation". Cochrane Database Syst Rev (1): CD001188. doi:10.1002/14651858.CD001188.pub3. PMID 18253987. ↑ Carson KV, Verbiest ME, Crone MR, et al. (2012). Carson KV, ed. "Training health professionals in smoking cessation". Cochrane Database Syst Rev. 5: CD000214. doi:10.1002/14651858.CD000214.pub2. PMID 22592671. ↑ Papadakis S, McDonald P, Mullen KA, Reid R, Skulsky K, Pipe A (2010). "Strategies to increase the delivery of smoking cessation treatments in primary care settings: a systematic review and meta-analysis". Prev Med. 51 (3–4): 199–213. doi:10.1016/j.ypmed.2010.06.007. PMID 20600264. ↑ "What you need to know about electric cigarettes". Royal College of Physicians. 2014-03-20. Retrieved 2015-01-14. ↑ Caponnetto, Pasquale; Campagna, Davide; Cibella, Fabio; Morjaria, Jaymin B.; Caruso, Massimo; Russo, Cristina; Polosa, Riccardo (2013-06-24). "EffiCiency and Safety of an eLectronic cigAreTte (ECLAT) as Tobacco Cigarettes Substitute: A Prospective 12-Month Randomized Control Design Study". PLOS ONE. 8 (6): e66317. doi:10.1371/journal.pone.0066317. ISSN 1932-6203. PMC 3691171 . PMID 23826093. ↑ "Smoking - tips on how to quit". Nlm.nih.gov. 2012-07-27. Retrieved 2012-08-05. ↑ He, Dong; Berg, John E.; Høstmark, Arne T. (March 1997). "Effects of acupuncture on smoking cessation or reduction for motivated smokers". Preventive Medicine. 26 (2): 208–214. doi:10.1006/pmed.1996.0125. PMID 9085389. ↑ White, AR; Rampes, H; Liu, JP; Stead, LF; Campbell, J (23 January 2014). "Acupuncture and related interventions for smoking cessation.". The Cochrane database of systematic reviews. 1: CD000009. doi:10.1002/14651858.CD000009.pub4. PMID 24459016. ↑ Lis-Balchin M (2006). Aromatherapy science: a guide for healthcare professionals. London: Pharmaceutical Press. p. 101. ISBN 0-85369-578-4. ↑ Rose JE, Behm FM (1994). "Inhalation of vapor from black pepper extract reduces smoking withdrawal symptoms". Drug Alcohol Depend. 34 (3): 225–9. doi:10.1016/0376-8716(94)90160-0. PMID 8033760. ↑ "Hypnosis for Quitting Smoking". WebMD. Retrieved 19 May 2012. ↑ Johnson, D.L. ; Karkut, R.T. (October 1994). "Performance by gender in a stop-smoking program combining hypnosis and aversion". Psychological reports. 75 (2): 851–7. doi:10.2466/pr0.1994.75.2.851. PMID 7862796. ↑ Law, Malcolm; Tang, Jin Ling (1995). "An analysis of the effectiveness of interventions intended to help people stop smoking". Arch Intern Med. 155 (18): 1933–1941. doi:10.1001/archinte.1995.00430180025004. PMID 7575046. ↑ Carmody TP, Duncan C, Simon JA, Solkowitz S, Huggins J, Lee S, Delucchi K (2008). "Hypnosis for smoking cessation: a randomized trial". Nicotine Tob Res. 10 (5): 811–8. doi:10.1080/14622200802023833. PMID 18569754. ↑ Mayo Clinic. "St. John's Wort for Tobacco Cessation". ↑ Mayo, Clinic. "St. John's Wort for Tobacco Cessation". US National Institute of Health. Retrieved 29 November 2006. ↑ FDA. "FDA Poisonous Plant Database". ↑ FDA. "FDA Poisonous Plant Database". U.S. Food and Drug Administration. Retrieved 1 January 2008. ↑ Nelson, Lauren. "Hallucinogen in 'magic mushrooms' helps longtime smokers quit in Hopkins trial". Hub. Johns Hopkins University. Retrieved 9 July 2016. ↑ SCENIHR. Health Effects of Smokeless Tobacco Products (PDF) (Report). p. 103. 1 2 3 Grimshaw GM, Stanton A (2006). Grimshaw, Gill, ed. "Tobacco cessation interventions for young people". Cochrane Database Syst Rev (4): CD003289. doi:10.1002/14651858.CD003289.pub4. PMID 17054164. ↑ "Intensive Counseling of Students by School Nurses Does Not Have Larger Impact on Long-Term Smoking Rates Than Briefer Sessions". Agency for Healthcare Research and Quality. 2013-05-15. Retrieved 2013-07-10. ↑ Philip, Owen. "Pregnancy and Smoking". Net Doctor. Retrieved 9 April 2012. 1 2 West R, Shiffman S (2007). Fast facts: smoking cessation (2nd ed.). Abingdon, England: Health Press Ltd. ISBN 978-1-903734-98-8. ↑ Caponnetto P; Russo C; Bruno CM; Alamo A; Amaradio MD; Polosa R. (March 2013). "Electronic cigarette: a possible substitute for cigarette dependence.". Monaldi archives for chest disease. 79 (1): 12–19. PMID 23741941. ↑ Naqvi NH, Rudrauf D, Damasio H, Bechara A (2007). 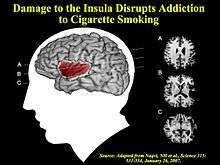 "Damage to the insula disrupts addiction to cigarette smoking". Science. 315 (5811): 531–4. doi:10.1126/science.1135926. PMC 3698854 . PMID 17255515. ↑ King G, Yerger VB, Whembolua GL, Bendel RB, Kittles R, Moolchan ET (2009). "Link between facultative melanin and tobacco use among African Americans" (PDF). Pharmacol Biochem Behav. 92 (4): 589–96. doi:10.1016/j.pbb.2009.02.011. PMID 19268687. ↑ Christakis NA, Fowler JH (2008). "The collective dynamics of smoking in a large social network". N Engl J Med. 358 (21): 2249–58. doi:10.1056/NEJMsa0706154. PMC 2822344 . PMID 18499567. ↑ Peoples, Clayton D.; Sigillo, Alexandra E.; Green, Morgan; Miller, Monica K. (2012). "Friendship and Conformity in Group Opinions: Juror Verdict Change in Mock Juries". Sociological Spectrum. 32 (2): 178–193. doi:10.1080/02732173.2012.646163. 1 2 Glassman AH, Helzer JE, Covey LS, Cottler LB, Stetner F, Tipp JE, Johnson J (1990). "Smoking, smoking cessation, and major depression". JAMA. 264 (12): 1546–9. doi:10.1001/jama.1990.03450120058029. PMID 2395194. ↑ Condiotte MM, Lichtenstein E (1981). "Self-efficacy and relapse in smoking cessation programs". J Consult Clin Psychol. 49 (5): 648–58. doi:10.1037/0022-006X.49.5.648. PMID 7287974. ↑ Shiffman S (1982). "Relapse following smoking cessation: a situational analysis". J Consult Clin Psychol. 50 (1): 71–86. doi:10.1037/0022-006X.50.1.71. PMID 7056922. 1 2 3 4 5 6 7 8 9 10 11 Kaiser Foundation Health Plan of the Northwest (2008). Cultivating Health: Freedom From Tobacco Kit. Kaiser Permanente. ISBN 978-0-9744864-8-2. ↑ H.-J. Aubin; A. Farley; D. Lycett; P. Lahmek; P. Aveyard. (2012). "Weight gain in smokers after quitting cigarettes: meta-analysis". BMJ-British Medical Journal. 345 (345): e4439. doi:10.1136/bmj.e4439. ↑ Vanni H, Kazeros A, Wang R, Harvey BG, Ferris B, De BP, Carolan BJ, Hübner RH, O'Connor TP, Crystal RG (2009). "Cigarette smoking induces overexpression of a fat-depleting gene AZGP1 in the human". Chest. 135 (5): 1197–208. doi:10.1378/chest.08-1024. PMC 2679098 . PMID 19188554. 1 2 Jo YH, Talmage DA, Role LW (2002). "Nicotinic receptor-mediated effects on appetite and food intake". J Neurobiol. 53 (4): 618–32. doi:10.1002/neu.10147. PMC 2367209 . PMID 12436425. ↑ Klag MJ (1999). Johns Hopkins family health book. New York: HarperCollins. p. 86. ISBN 0-06-270149-5. ↑ Covey LS, Glassman AH, Stetner F (1997). "Major depression following smoking cessation". Am J Psychiatry. 154 (2): 263–5. doi:10.1176/ajp.154.2.263. PMID 9016279. ↑ Borrelli B, Bock B, King T, Pinto B, Marcus BH (1996). "The impact of depression on smoking cessation in women". Am J Prev Med. 12 (5): 378–87. PMID 8909649. ↑ Máirtín S. McDermott; Theresa M. Marteau; Gareth J. Hollands; Matthew Hankins; Paul Aveyard. "Change in anxiety following successful and unsuccessful attempts at smoking cessation: cohort study". BJP. ↑ American Cancer Society (2011-01-31). 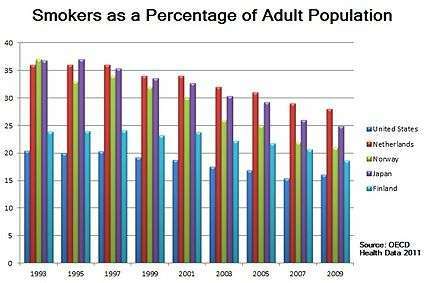 "When smokers quit -- What are the benefits over time?". Retrieved 2011-02-20. ↑ Peto R, Darby S, Deo H, Silcocks P, Whitley E, Doll R (2000). "Smoking, smoking cessation, and lung cancer in the UK since 1950: combination of national statistics with two case-control studies". BMJ. 321 (7257): 323–9. doi:10.1136/bmj.321.7257.323. PMC 27446 . PMID 10926586. 1 2 Doll R, Peto R, Boreham J, Sutherland I (2004). "Mortality in relation to smoking: 50 years' observations on male British doctors". BMJ. 328 (7455): 1519. doi:10.1136/bmj.38142.554479.AE. PMC 437139 . PMID 15213107. ↑ "Smoking Cessation Reduces Postoperative Complications". Journalist's Resource.org. ↑ Cromwell J, Bartosch WJ, Fiore MC, Hasselblad V, Baker T (1997). "Cost-effectiveness of the clinical practice recommendations in the AHCPR guideline for smoking cessation". JAMA. 278 (21): 1759–66. doi:10.1001/jama.278.21.1759. PMID 9388153. ↑ Hoogendoorn M, Feenstra TL, Hoogenveen RT, Rutten-van Mölken MP (2010). "Long-term effectiveness and cost-effectiveness of smoking cessation interventions in patients with COPD". Thorax. 65 (8): 711–8. doi:10.1136/thx.2009.131631. PMID 20685746. ↑ Bauld L, Boyd KA, Briggs AH, Chesterman J, Ferguson J, Judge K, Hiscock R (2011). "One-year outcomes and a cost-effectiveness analysis for smokers accessing group-based and pharmacy-led cessation services". Nicotine Tob Res. 13 (2): 135–45. doi:10.1093/ntr/ntq222. PMID 21196451. ↑ Schiaffino A, Fernández E, Kunst A, Borrell C, García M, Borràs JM, Mackenbach JP (2007). "Time trends and educational differences in the incidence of quitting smoking in Spain (1965–2000)". Prev Med. 45 (2–3): 226–32. doi:10.1016/j.ypmed.2007.05.009. PMID 17604832. ↑ Fowkes FJ, Stewart MC, Fowkes FG, Amos A, Price JF (2008). "Scottish smoke-free legislation and trends in smoking cessation". Addiction. 103 (11): 1888–95. doi:10.1111/j.1360-0443.2008.02350.x. PMID 19032538. ↑ Federico B, Costa G, Ricciardi W, Kunst AE (2009). "Educational inequalities in smoking cessation trends in Italy, 1982–2002". Tob Control. 18 (5): 393–8. doi:10.1136/tc.2008.029280. PMID 19617220. ↑ Zuo, Xiaoan; Zhao, Halin; Zhao, Xueyong; Guo, Yirui; Yun, Jianying; Wang, Shaokun; Miyasaka, Takafumi (2009). "Cigarette smoking among adults and trends in smoking cessation - United States, 2008". MMWR Morb Mortal Wkly Rep. 58 (44): 1227–32. PMID 19910909. ↑ Qian J, Cai M, Gao J, Tang S, Xu L, Critchley JA (2010). "Trends in smoking and quitting in China from 1993 to 2003: National Health Service Survey data". Bull World Health Organ. 88 (10): 769–76. doi:10.2471/BLT.09.064709. PMC 2947036 . PMID 20931062. ↑ Martin, Anya (May 13, 2010). "What it takes to quit smoking". MarketWatch. Dow Jones. p. 2. Retrieved May 14, 2010. Wikimedia Commons has media related to Smoking cessation. Jason Wright (2013). "Knowing How To Quit Smoking". 1 (1): 38. ISBN 978-1494238452. Henningfield J, Fant R, Buchhalter A, Stitzer M (2005). "Pharmacotherapy for nicotine dependence". CA Cancer J Clin. 55 (5): 281–99; quiz 322–3, 325. doi:10.3322/canjclin.55.5.281. PMID 16166074. Hughes JR, Keely J, Naud S (2004). "Shape of the relapse curve and long-term abstinence among untreated smokers". Addiction. 99 (1): 29–38. doi:10.1111/j.1360-0443.2004.00540.x. PMID 14678060. Hutter H, Moshammer H, Neuberger M (2006). "Smoking cessation at the workplace: 1 year success of short seminars". Int Arch Occup Environ Health. 79 (1): 42–8. doi:10.1007/s00420-005-0034-y. PMID 16133522. Peters MJ, Morgan LC (2002). "The pharmacotherapy of smoking cessation". Med J Aust. 176 (10): 486–90. PMID 12065013. West R (2006). "Tobacco control: present and future". Br Med Bull. 77-78 (1): 123–36. doi:10.1093/bmb/ldl012. PMID 17106058. McFarland JW, Folkenberg EJ (1964). How to stop smoking in five days (PDF). Englewood Cliffs, NJ: Prentice-Hall.